thank you for sharing these lovely projects love to work with leather and you sharing aworsome ideas. Hi, could you tell me what kind of snap pliers you used? Thanks!! Hi had a question how did you cut the blue leather what kind of scissors did you used? Hi, my name is Rebecca! I absolutely loved this idea, however, your pattern is slightly flawed. 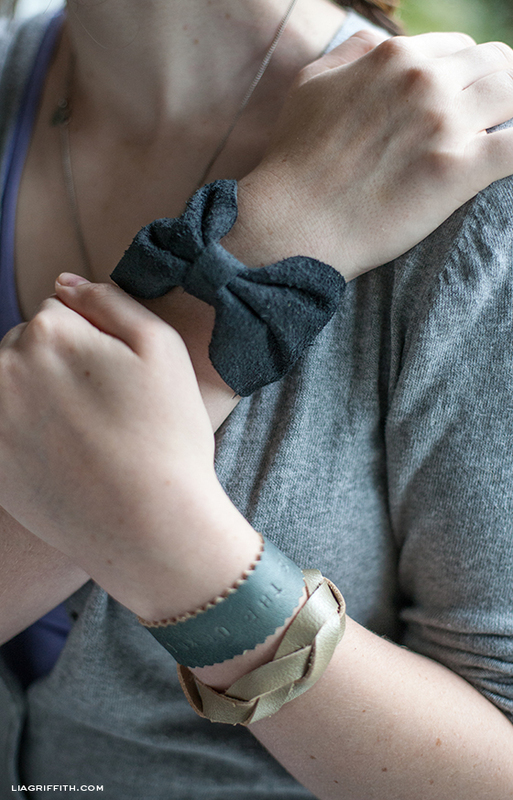 Though, admittedly, I did use a thicker leather, the bow bracelet pattern made a bracelet that was far too small, even for my teenage daughter! The braid was only slightly better. So, as a disclaimer for the folks out there, a thicker leather will require you to enlarge the pattern to accommodate. Other than that, I loved the idea! Thanks Rebecca. I am thinking that when you printed the PDF it may have fit to page rather than printed at full size, thus making it a smaller pattern. One thought, try the patten on before cutting the leather and adjust or reprint at that time. Hi… Amazing and well done! So cute, looks great. Thanks for the link to leather supplies. These are all so beautiful! I would wear everyone of them. Where did you get the leather stamps? Was just thinking I needed something like that for another leather project I had in mind. ~M. Thank you so much, Lia! I’m pleasantly surprised to see how cost effective they are. Had always imagined I had to shell out an arm and a leg for a set of these. ~M. I know! If I broke down the cost it would be less than $1 each for the leather scrap and the snap. Great holiday gift idea, right? Cool! 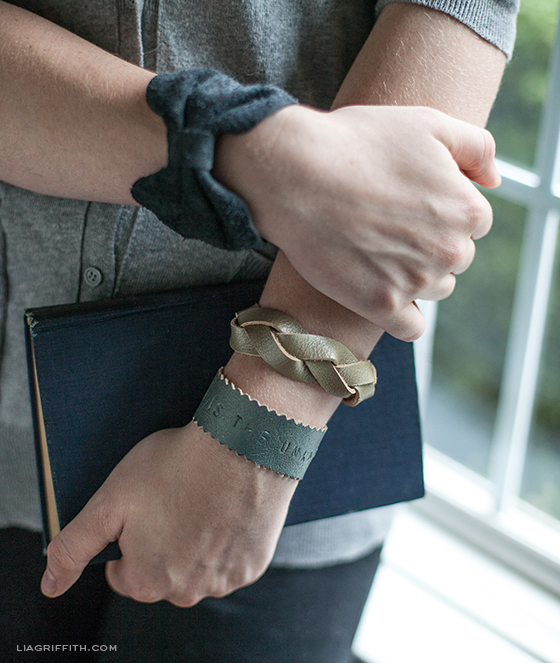 I’m all about recycling, so I’m thinking you could use these patterns with old bike tubes as well, if you didn’t have any leather scraps. Yes! Great idea! My cousin was wearing a bracelet made from a bike tube that she picked up on her visit here. It was so cute! Lia, I’m definitely going to make these! I’ve been hanging on to pieces of leather that were probably from a sample book. I bought them at a thrift store for $5. I’ve already given away several pieces. Just been looking for perfect projects for them. I think I’ve found one! Holiday gifts! 🙂 I have this idea for leather earrings, maybe feather shaped. We will see. 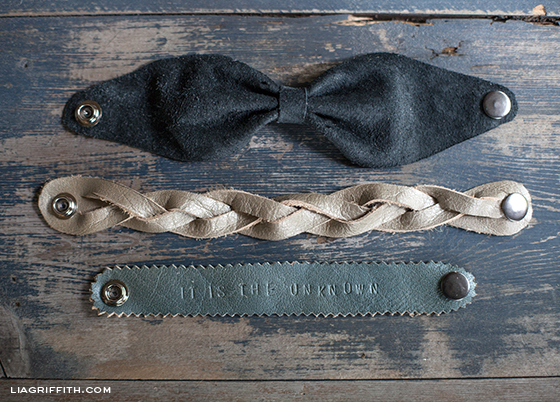 ohhh… i definitely want to make the one with the bow!! Oh these are incredible, love them. 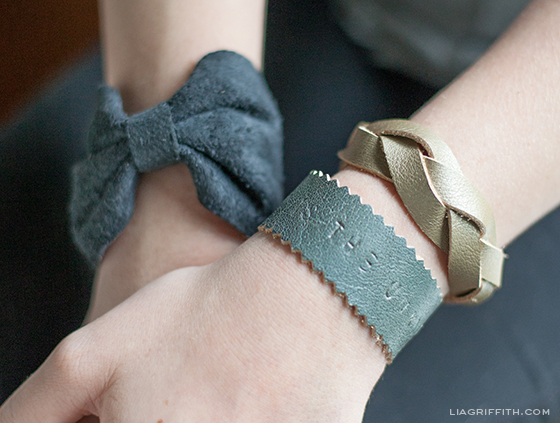 I think these bracelets might be something my hubs might want to try. He’s pretty good at crafting himself. He’s made wire jewelry before much better than I ever could. Hubs had a stroke almost 3 yrs. ago and needs to use his hands, especially left hand that was affected by the stroke, plus he’s left handed. My hands don’t work too well at this point in my life, very little strength and dexterity. Excellent choice of ideas also. You are a genius but I might have told you that before, if I haven’t I should have. Thanks JaneEllen, you are so sweet! I love that these can be made from mere scraps. I want to make some leather hanging earrings next too. your tutorials. They’re always so easy to follow. Haha. Well. . . I do rush around since I have a lot to get done in a short time. A leisurely visit to the craft store sounds divine!